Several Tahoe ski resorts are closed Sunday due to large snow totals that hit the region Saturday. The extreme amount of snow, especially in a short period of time, is not always a good thing for skiing and snowboarding Lake Tahoe. Squaw Valley and Alpine Meadows will be closed Sunday (Feb. 10) due to high winds and avalanche danger. 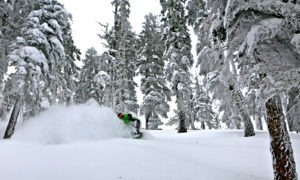 Northstar California skiers and riders braved some tough conditions Sunday after the resort received 37 inches of snow over the previous 24 hours. Sierra-at-Tahoe, which received 37 inches of snow over the previous 24 hours, was also closed Sunday due to road closures and extreme avalanche danger. At Heavenly Mountain, the Gondola was on hold late morning and multiple lifts would be closed all day. See Tahoe Snow Report below for updated totals at Tahoe ski resorts. After getting a regional high of 100 inches of snow during the previous week, Homewood Mountain received 4 feet of snow by Sunday morning (Feb. 10), the most among Tahoe ski resorts. Homewood, which now has 350 inches of snow for the 2018-19 season, posted this message on its website, one that probably resonated Sunday morning with many Tahoe ski resorts. “Our team is working hard to dig out, conduct avalanche control and open the mountain as soon as possible. But please expect delays. Safety is our number-one priority. We will provide updates as soon as we can,” noted the Homewood website post. 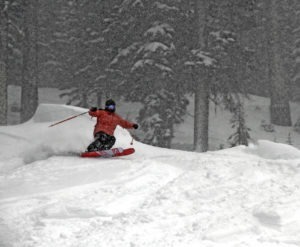 Squaw Valley continues to accumulate impressive snow totals for the season. The resort received 46 inches in the past day and now has a high among Tahoe ski resorts of 393 inches (32¾ feet) for the 2018-19 season. Boreal Mountain had 41 inches over the previous 24 hours and now has a season snow total of 348 inches. Following large snow storms, Diamond Peak is typically determined to get the resort operational for a day of powder for its loyal skiers and snowboarders. The resort, located in Incline Village, received 28 inches of snow from the latest storm and has 237 inches to date. 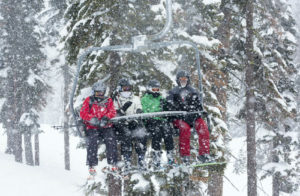 Family-friendly Diamond Peak ski resort in Incline Village is experiencing one of its best powder days of the season. Raymore reported that Diamond Peak’s upper mountain opened around 10 am after it dug out the Crystal Express chair. WEATHER FORECAST: More snow will be accumulating at Tahoe ski resorts over the next week, culminating with perhaps 4 feet of snow by Friday morning (Feb. 15). According to OpenSnow California Snow Forecaster, Bryan Allegretto, a steady snow should move out of the Tahoe region Sunday morning with only a chance for scattered snow showers during the afternoon. Winds, which were vicious at times Saturday, should be lighter Sunday yet still gusting up to 30 mph on the ridges. Allegretto says that another storm moves into Lake Tahoe on Tuesday night into Thursday. The storm could deliver another 2-4 feet of snow at Tahoe ski resorts. Another storm could arrive Friday through President’s Weekend (Feb. 15-17), but lighter snow showers and only a few inches of snow are predicted. Homewood Mountain reported the most snow Sunday among Tahoe ski resorts with 4 feet.